Ravenscar Hollow is a small cave inhabited by hagravens west of the Thalmor Embassy and due east of the Steed Stone. It is found by going east along the road that passes Wolfskull Cave and following the road a ways downhill past a switchback until you see two cairns on the left. A path begins here that winds its way downhill past several more cairns and along the shore to the entrance of the cave. There are several blue mountain flowers and a purple mountain flower around the piles of rocks marking the path, with several spiky grass plants and a tree stump with mora tapinella growing on it along the path. 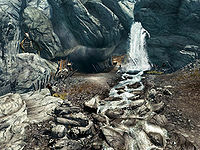 There is a leveled animal guarding the entrance and a waterfall just to the right that forms a stream across the path. Outside of the entrance there are the typical sharpened stakes, human bones, and goat's and skeever's heads on stakes found near hagraven dwellings. Upon entering there is a darkened tunnel with a pool of water ahead on the left-hand side of the cave. There is nothing of interest in the water. The path follows the shore along the west wall of the cave past a couple of bone chimes hanging from the ceiling. To the southeast can be seen a raised ledge with stakes along the side. Just past the hanging bone chimes, there is another set of chimes stretched across the path. A short way past this there is an iron ore vein against the west wall. The path continues around the water before passing behind a rock pillar and turning to the north; here there are steps up to the raised section where a hagraven and a leveled creature reside. The hagraven has a copy of the Ravenscar Hallow cage key in her possession. 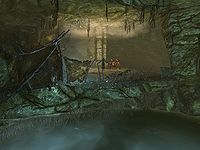 There is a hagraven tent at the rear of the raised section with a dead skeever in front of it and a lever in the northeastern corner that opens a hidden door to the left of it. Beyond the hidden door is another room with a long wooden table immediately on the right with a potion of minor healing, an enchanter's draught, a ruined book, a ruby, an amethyst, and a garnet on top. A second potion of minor healing can be found on the ground in front of the table. To the northeast is a bandit trapped in an adept-locked cage who will spot you as soon as you enter the room and repeatedly ask you to let him out, offering to help you "slaughter the rest of the crows". There is a second (empty) cage beside the first, and against the north wall there are two dead bandits and a dead spriggan. To the west is a ramp leading up to raised area with another tent on top, while to the northwest is a lower area with two more cages, one of them adept-locked and holding a dead bandit and two potions of minor healing; like the live bandit's cage, this cage is also openable with the Ravenscar Hallow cage key. There is a hagraven in the lower area and a second one behind the tent in the upper area. If you released the bandit after defeating the hagravens, he will now turn on you and demand everything you have. This adversary is not a serious threat, as he does not equip the armor he carries and is armed only with a random "lucky dagger". On the lower level there is an unlocked chest next to a long wooden table with a random poison and a copy of the Destruction skill book The Art of War Magic on top. Near the second set of cages, there is a corundum ore vein on the ground against the north wall. The tent in the upper area is empty (see bugs). Behind the tent is a balcony that overlooks the pool of water in the first room; this can be used as a shortcut back to the exit. If you are noisy while defeating the first hagraven, it will alert the others in the room behind the secret door. They will likely be attacking the imprisoned bandit. Before entering Ravenscar Hollow there is an iron ore vein located to the left of the cave entrance on the opposite side of the inlet by the shore. It is possible to get stuck in the tent on the upper level. You can free yourself with a lot of wiggling. Turning sideways may help.